This is the ninth in a series of articles about the basics of developing SharePoint-hosted SharePoint Add-ins. You should first be familiar with SharePoint Add-ins and the previous articles in this series, which you can find at Get started creating SharePoint-hosted SharePoint Add-ins. 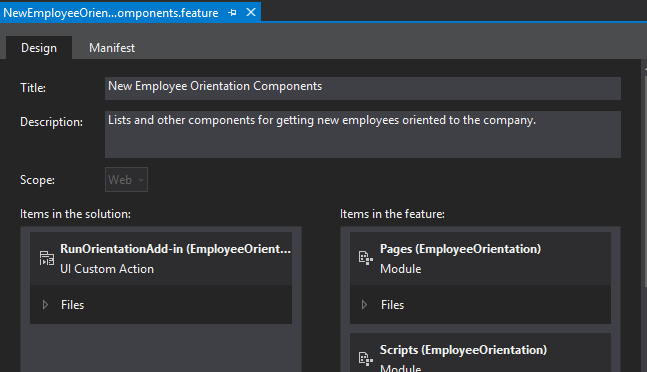 If you have been working through this series about SharePoint-hosted add-ins, you have a Visual Studio solution that you can use to continue with this topic. You can also download the repository at SharePoint_SP-hosted_Add-Ins_Tutorials and open the BeforeRibbon.sln file. All SharePoint Add-ins can be run from the Site Contents page of the host web by selecting the add-in's tile. The functionality of a SharePoint Add-in can also be exposed on the host web through custom actions, which are custom ribbon buttons or custom menu items. In this article you add a button to the ribbon on a host web. To add the button to the ribbon of a calendar on the host web, take the following steps in the UI of your SharePoint developer site. From the home page of the site, select Site Contents > add and add-in > Calendar. In the Adding Calendar dialog, for the Name, enter Employee Orientation Schedule, and then select Create. When the calendar opens, put the cursor on any date until the Add link appears on the date, and then select Add. In the Employee Orientation Schedule - New Item dialog, for the Title, enter Orient Cassi Hicks. Leave the other fields at their defaults, and then select Save. The next procedure requires that the calendar be visible in the UI of Visual Studio, but it won't be if Visual Studio was open when you created the calendar. Before you continue, close Visual Studio, and sign out of any browser windows and PowerShell consoles where you are signed in to your developer site. In Solution Explorer, right-click the EmployeeOrientation project, and select Add > New Item > Office/SharePoint > Ribbon Custom Action. Name it RunOrientationAdd-in, and then select Add. The Create Custom Action for Ribbon Wizard asks you a series of questions. Give the answers from the following table, and then select Finish. Where is the custom action scoped to? Select List Instance (not List Template). Which particular item is the custom action scoped to? Select Employee Orientation Schedule. What is the text on the menu item? Enter Employee Orientation. Where does the custom action navigate to? Do not use the drop-down selections. Instead, enter ~appWebUrl/Lists/NewEmployeesInSeattle. This is the list view page for the list, which is on the add-in web, so the ribbon button on the host web opens a page on the add-in web. In Solution Explorer, expand the Features folder, and select the NewEmployeeOrientationComponents feature. The Feature designer opens. Notice that the custom action that you created, RunOrientationAdd-in, is listed in Items in the solution, but not in Items in the feature. This is because the feature is deployed to the add-in web, but your custom action is deployed to the host web. When you package the add-in in Visual Studio for deployment to production, or when you select F5 in Visual Studio, the Office Developer Tools for Visual Studio creates a special host web feature, adds the custom action to it, and deploys it to the host web. You should never edit the host web feature; that is why it is not created until packaging time. The default page of the SharePoint Add-in opens. Go to the home page of your developer site (which is the host web). There is a breadcrumb link to it in the upper-left corner of the page. On the host web's home page, select Site Contents, and on the Site Contents page, select the Employee Orientation Schedule calendar (not the Employee Orientation add-in). In the Actions group on the ribbon, select Employee Orientation. The list view page for New Employees in Seattle opens.